The actor also expressed his appreciation to moviegoers who showed their support for "Black Panther"
In this Saturday, June 16, 2018, photo, Chadwick Boseman, left, gives his best hero award for his role in "Black Panther" to James Shaw Jr., who is credited with saving lives during a shooting at a Waffle House in Antioch, Tenn., at the MTV Movie and TV Awards at the Barker Hangar in Santa Monica, Calif. There are movie heroes and then there are real-life heroes. During Monday night's 2018 MTV Movie &TV Awards, pop culture fans were thrilled when Chadwick Boseman won the Best Hero award for his role in "Black Panther." "Receiving an award for playing a superhero is amazing, but it's even greater to acknowledge the heroes that we have in real life. So I just want to acknowledge somebody that's here today. James Shaw Jr. Where are you? Stand," Chadwick said. "You didn't even know we were about to do this, did you? If you don't know James Shaw Jr., he fought off a gunman in Antioch, Tennessee, at a Waffle House. He saved lives." Visibly surprised, Shaw received a standing ovation from the audience as he walked on and off stage. He also posed for photos with the actor backstage. James Shaw Jr. is being called a hero by law enforcement for wrestling the gun away from the shooter inside a Nashville-area Waffle House Sunday. Hear the details of his encounter. During his acceptance speech, the actor also expressed his appreciation to moviegoers who showed their support for "Black Panther." 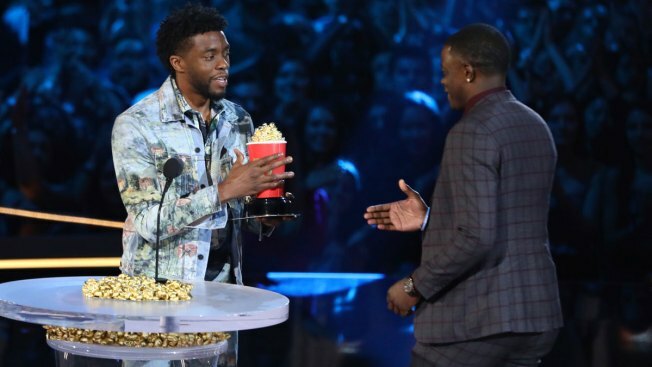 Original Post: Chadwick Boseman Dedicates MTV Movie & TV Awards Win to Waffle House Hero James Shaw Jr.